I still have so many images to go through from my trip to Yellowstone and Grand Teton National Parks in September, but here is a frame that jumped out at me during an initial scan through the photos. When you have a chance to get close to such amazing wildlife like this herd of pronghorn, it's easy to get caught up taking intimate portraits of them, but I tried to also step back a bit with the zoom and place them in their environment. 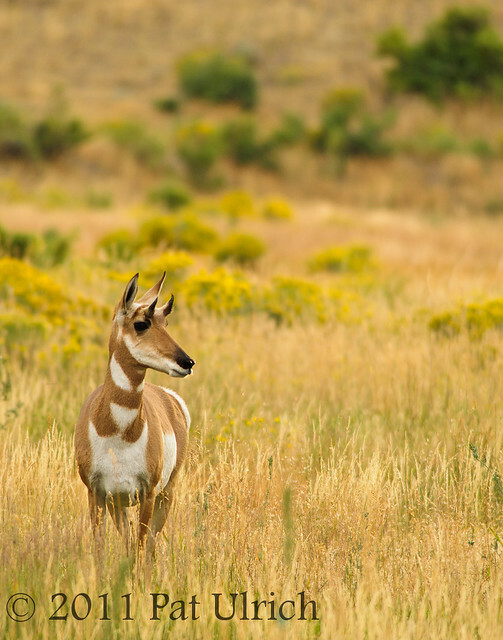 Pronghorn are so well suited to their prairie home, and they look beautiful when surrounded by tall grasses. Here is one of my favorite shots from today in Yellowstone National Park, which was chosen for today's upload at my wife's request. 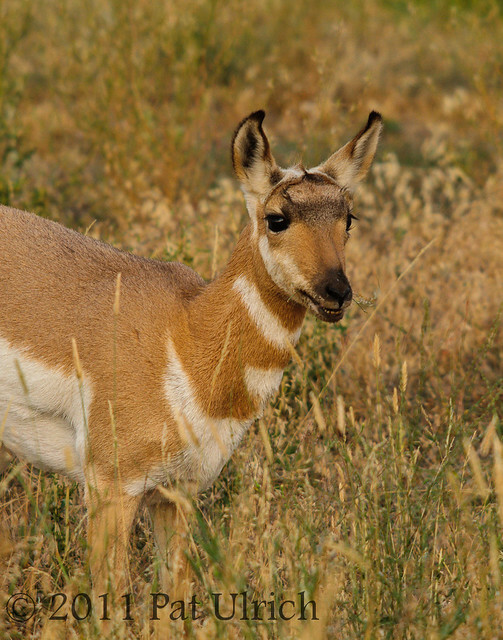 This photo cracks her up since it appears that the pronghorn is smiling into the camera and saying "Cheese!" She's always joking that wildlife likes to pose for me, so this one was her favorites. We had a great close-up encounter with a group of pronghorn this morning, and some of the other highlights included seeing wolves (and pups!) through the binoculars in the Lamar Valley, as well as a grizzly bear! Both were feeding at different times on a bison carcass that was really far away -- but thanks to some friendly people with scopes, we were able to get a pretty good glimpse of them. We spent our first full day in Yellowstone National Park today, and we were able to find some interesting wildlife. In addition to the standard bison and elk, we saw a coyote hunting in the grass and some big horn sheep after the sun had set. We also believe we saw two gray wolves in Hayden Valley. However, we only saw them as tiny black dots in the binoculars. Those around us at the turnout had been watching them for a little while, and claimed that's what they were. I'm still hoping to see one that I can recognize in the binoculars. 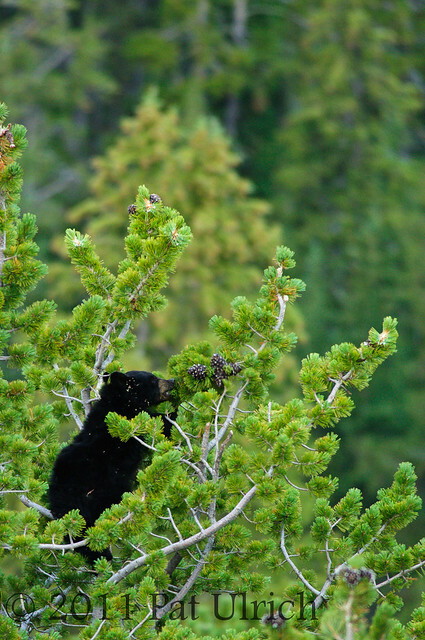 One of the highlights was watching a family of black bears feed on pinecones in the top of the trees along Dunraven Pass. 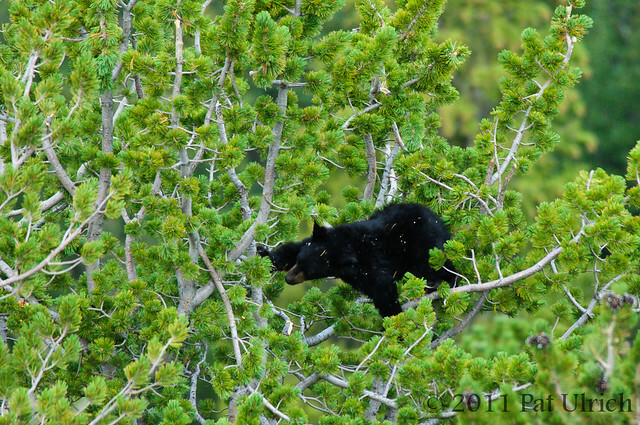 There was a mother and two cubs, one of which is shown in these shots. All three moved through the tree so easily, and with the tree growing on such a steep slope, one wrong move could have been very bad. But no worries, they all made it down safely! We'll be out again for sunrise tomorrow -- and I'm looking forward to what we might find! A quick update from the road. We're having an awesome trip so far, and have seen a lot of wildlife in Grand Teton National Park. In addition to a few herds of bison and pronghorn, we've seen bald eagles, pikas (as cute as promised! 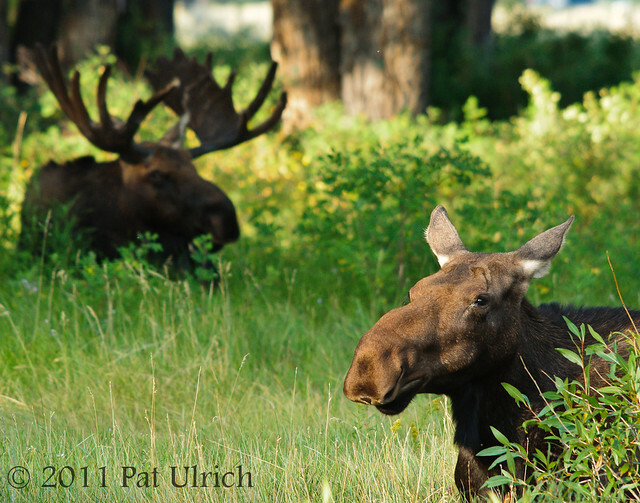 ), and so far 7 different moose! These animals are fascinating, and I didn't fully appreciate their size until I saw one for myself. We first saw this female relaxing in the grass, then as I was getting my camera ready to photograph her, this large bull came strolling by. It appears that he is courting her, and he kept quite close with a watchful eye on her. 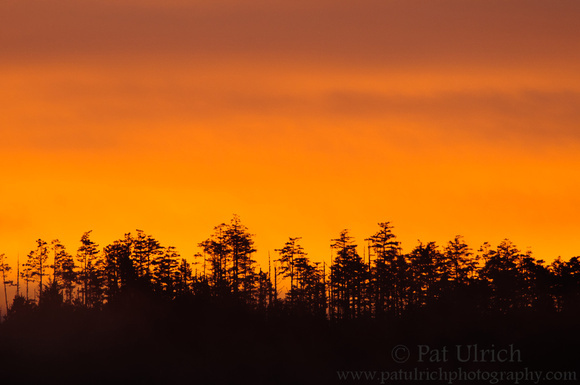 The sunrise over Inverness Ridge in Point Reyes National Seashore. 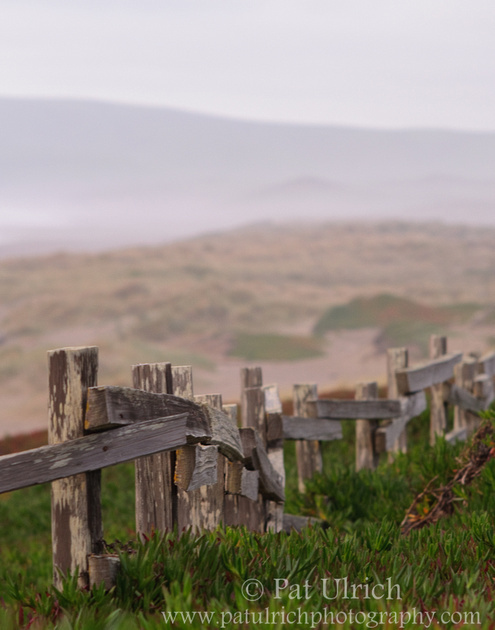 The Point Reyes Peninsula is a very special place to me. It’s where I go to relax, it’s where I clear my thoughts, it’s where I feel so alive as the breeze touches my face or the scents of the coast reach my nose. When I close my eyes and let my mind drift to my happy place, it’s always Point Reyes. There is something about the landscape there that captivates me. I can’t quite put my finger on what exactly it is. There are so many amazing places in California, some well known and still spectacular (i.e., Yosemite National Park) and some under the radar that can be just as amazing (pick any beach along the Sonoma Coastline). But yet, as I realized that my time was running short in California, and that I would only be able to visit my favorite places or try out new ones just a handful of times, all else was forgotten and my eyes (and my heart) were set on Point Reyes. I think the landscape is beautiful, and I know I’m not the only one (it was even recently recognized on ABC’s Good Morning America during their segment on the 10 most beautiful places in the country) – but when I take a step back, set my emotions aside, and try to think about what makes it so special, it’s hard to say exactly what it is. Sure, the coastline is spectacular with gorgeous bluffs and long beaches of soft sand, but you can find this in other places. And perhaps surprisingly, a lot of the land is agricultural pastures, and you’ll often see far more cows than anything else on a trip. But somehow, that just makes sense there. And the miles upon miles of old weathered fences pull me in every time. I once thought to myself, there are so many interesting fence posts here, that if I had the time, I could make a photographic book of just the beautiful patterns in the wood, the interesting mosses and lichens growing on them, the wildflowers that bloom along them, the raptors and quail that sit on the posts, and the songbirds that so elegantly perch along the wire, and maybe, just maybe a deer or elk leaping over one. But set into this speckled land of fenced-off pastures are the rolling hills, the large sand dunes, and the small coastal mountains that add amazing depth and life to the landscape. Perhaps though for me, it’s not just that landscape that has gripped me so deeply. I know what wild things are out there, and the chance to spot one, and hopefully photograph one, always keeps me coming back for more. So many times in the past few years, as I’m getting my camera ready the night before an outing, my wife will ask me where I’m headed the next morning. And with much regularity, I’ll say “Point Reyes.” She’ll often chuckle and reply, “Did I even have to ask?” It’s funny to me to realize that it took us a year of being in California to even take a hike there, but I can still remember that trip in much detail. After parking under a typical summer morning of heavy fog, we saw a quail for the first time near the trailhead, saw some tule elk off in the distance on a hillside, and we even saw a coyote (or maybe it was a grey fox?) through the binoculars. We sat on a large log that had long since turned into a piece of driftwood to eat our lunch along the beach, and we watched the pelicans skim the tops of the waves under the quiet foggy sky. Then, when we were ready to move on, we got back onto the trail, and the fog lifted and the blue skies came out – and we were in awe as we walked along the coast and saw the crystal clear sky reflected in the beautiful blue waters of the Pacific Ocean. Me, excited to be in Point Reyes for the first time, but not yet knowing what this landscape would eventually mean to me. While thinking about what I wanted to write in this post, I became curious about just how many times I’ve been to the park. A quick scan though my photo archives reveals that since our inaugural hike in 2006, I’ve been back to Point Reyes some 60 additional times. What is it that keeps pulling me back again and again? Shouldn’t I have gotten bored with walking the same trails, seeing the same sights, and driving the same roads? A while back I read an interesting post on Greg Russell’s blog, which linked to a wonderful post about someone’s love of a specific desert landscape. In the comments, Greg replied back to me about how interesting it is that certain landscapes can capture the imagination and that he “thinks, perhaps, like choosing a mate; we need a fit with a complementary personality. 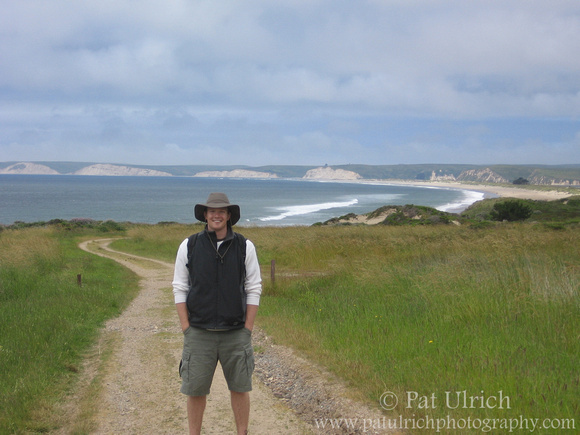 Landscapes or people, it’s all the same…” This idea rang so true for me with Point Reyes. A foggy sunset along Kehoe Beach in 2007. There is something in the personality of the park that just connects with me. I’ve been to many parks in California, and I’ve really enjoyed all of them. But there is just something so special to me about this one piece of land that it just keeps pulling me back. Perhaps it’s not worth my time to try to pinpoint what it is that I love about that park so much. But rather, just to enjoy the fact that I have a place that is so special to me, and that always makes me smile when I think of it. Point Reyes is my Happy Place, and I like to think that no matter how often or how little I’m able to visit throughout my lifetime, it will always give me that warm feeling of freedom inside my heart when thoughts of it cross my mind. 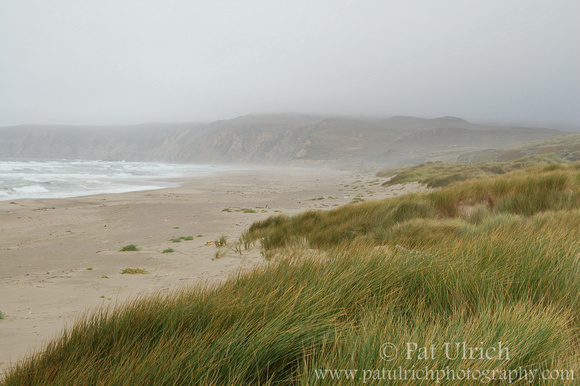 If you're interested to see more of Point Reyes, please visit my Point Reyes National Seashore Special Collections.